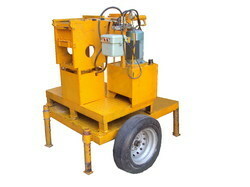 Manufacturer of stabalized mud brick machine, paving block machine, realtors etc. And also providing business consultancy services. The i-gura 3000 is the next generation in the brick construction industry,which is a fully automatic machine providing low cost building using earth as the source of construction. Cement would be mixed at a percentage as less as 5%. By using earth as building source, we attain 100% resistance to its natural disasters (I.e. tsunami, earthquakes, fire etc). Due to the water absorption level being minimal the internal temperature of the building constructed by these bricks is controlled. Moreover being a mobile machine the i-gura3000 can obtain 2000+ bricks per 8 hr shift. Materials used are easily and locally available and since the bricks can be manufactured in the construction site cost of transport, fuel and time can be avoided. Hope all is well a tyour end, This is Indika Guruge chairman - GG, we would like to introduce ourselves upon your query posed for investments, We Guruge Group is one the leading Reality, construction and Business consulting for the past 20 years in Sri Lanka it is one of the few in the country that conducts research to come up with innovative business concepts to overtake the standards set by its competitors. business progress raise rapidly day by day. We are now looking for the investors where we are creating their business platform all over the world. Currently our view is on our country's economic and market development, whereas the 30 Years of civil war has ended which in turn will increase the search for investments and business setup by the international businessmen as a proof (Microsoft's President Mr. Bill Gates has invested USD 500 million as start towards IT sector in Sri Lanka) and lot of other fellowship who will join hands to invest in Sri Lanka. Sri lanka is one for the prime target country for all the business people around the world, as we have already established the whole market for the past 20 years we would like to develop our business plans towards rebuilding the market of Sri Lanka. Sri Lanka is an incredibly popular tourist destination and secondly Sri Lanka is growing in popularity with Western second home seekers looking for an alternative and affordable winter sun destination which will be a good platform for the investors to invest in Reality, construction, hotels, est. Since Sri Lanka is an open market as of now, the property investment potential has increased were we Guruge Group has acquired huge land parcels during the past few years. If interested please do revert to asap.